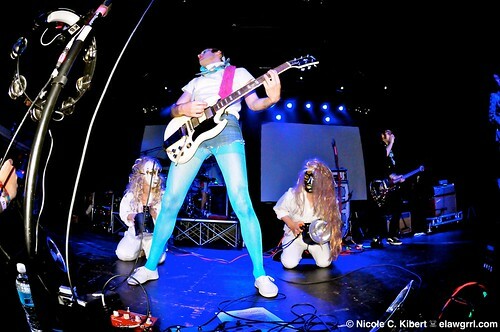 Of Montreal have a new album, False Priest, coming out on September 14. They also have a new EP, The Controller Sphere, out next spring. They’ve been busy. It’s too far away to even guess at a release date, but filmmaker Jim Jarmusch is working on a documentary about The Stooges, at the request of Iggy Pop himself. Ticketmaster CEO Nathan Hubbard wrote yesterday on their official blog about their decision to no longer hide extra-fees from users of their service. Aw look, Ticketmaster think they have “fans”. Adorable. Rich Aucoin released his EP Public Publication yesterday, and you can catch him live at Tiger Bar in Toronto tonight. His shows are supposed to be a time and a half, so that might be a good way to spend your Wednesday evening. If you’re able to get to The Seahorse in Halifax for September 4, Herohill is running a contest for a guestlist spot at that show. The Weakerthans have announced a set of concert dates where they will be performing a different one of their albums in its entirety each night in Winnipeg. I’d be pumped for the Left and Leaving night. The dates/records are as follows: December 15th through 18th the band will be performing Fallow, Left and Leaving, Reconstruction Site and Reunion Tour. Halifax Pop Explosion has announced their full line-up for the 2010 festival, and it’s mad stacked. Think: Basia Bulat, Boats, Cuff the Duke, Cursed Arrows, Dog Day, Gramercy Riffs, GWAR, Great Lake Swimmers, and a ton more!! ECMA (East Coast Music Association) Award & Showcase submissions are now open, so if you’re in an east-coast based band you should be checking this out! Award and showcase submissions for 2011 East Coast Music Week being held in Charlottetown, PEI April 13-17, are now open. The East Music Association (ECMA) is thrilled to once again be continuing its partnership with Sonicbids this year. Submissions can be made through http://www.ecma.com. Deadline for all submissions is Friday, October 1, 2010.